On Friday evening my young friend and I drove over to Camberley to see Paul and Debbie in their latest show. You aren't allowed to take photographs there so here's one I took earlier - as they say. Oops. wrong picture. this is Paul. Debbie's mum and dad and sister Donna were in the audience too. We all met up after the show in the foyer. Paul and Debbie were signing autographs. All the women were desperately trying to avoid being kissed by Paul. Why? I'll explain. The last act in the show was a new version of the magical disappearing bank note. Paul procured a £20 note from a member of the audience, and after getting him to sign it and remember the number, folded it up, then promptly lost it. Paul then took the guy to a table on the stage upon which were several items, including a union jack box, an onion, a pumpkin, a lemon, a candle and an egg. He was then asked to point to the item he thought might possibly be the clue to the whereabouts of his £20 note. He chose the egg. Paul peeled it, popped it in his mouth and started eating it whole. As the banknote wasn't to be seen he then chose the lemon. which Paul broke in two and sucked the juice into his mouth to add to the egg (the white of which could still be seen). Still no note, so the onion was the next item chosen. It was horrible to see, and we could only imagine what this combination tasted like! He next chose the pumpkin and was given a knife. But instead of cutting a face in it he chopped it around like a madman! You can understand now why none of the women wanted to be kissed by Paul. 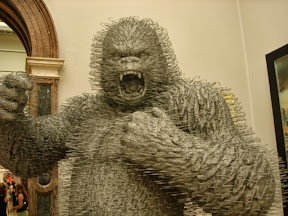 Nevertheless he did manage to grab hold of Donna. My young friend escaped the 'dragon's breath' magician! On Wednesday I took the train to London to attend the opening of The Royal Society of Miniature Painters exhibition. It was pouring with rain as I got out of the tube at Piccadilly Circus for the walk to the RAC Club. There a client from Singapore had left a miniature of his son for me to collect. (He wanted me to add more hair to the painting). By the time I walked the remaining distance to the Mall Galleries I was soaked. And so were my shoes! 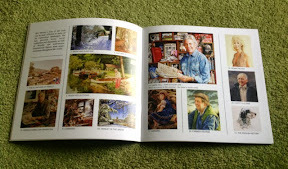 But I was soon among my many friends from the world of miniature painters. 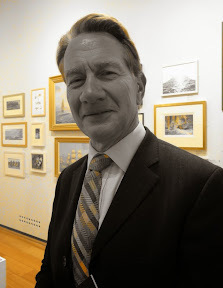 At 3 o'clock The politician Michael Portillo (and star of the current train journeys around Britain TV programme) came to open the exhibition. 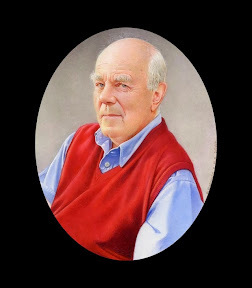 My prize - The Mundy Sovereign Award for the best portrait - was presented to David Lawson. After the presentations I spoke to Michael Portillo and asked if I could take a couple of photographs as a basis for a possible miniature portrait. Somehow my camera assumed a strange mode I'd not come across before and produced this result. Watch this space for a new miniature - hopefully in full colour. While on the subject of miniatures I was told a couple of days ago that I'd been awarded second prize in the portrait category at the current miniature exhibition in Washington USA. Having never submitted to this annual exhibition before I was pleased to have been honoured in this way (and as a good friend and excellent portrait painter Michael Coe won the first prize in the category I didn't mind coming second). 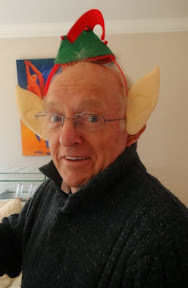 it was also very pleasing that my miniature of Vic Granger - one of my oldest friends and fellow artist who sadly died last year - was the prizewinner. 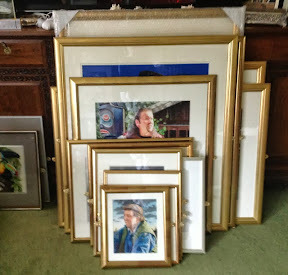 Now I'm getting my paintings ready for the exhibition. All of the large pictures - 70 - need to have 'mirror' fixings attached to them. This is to enable the gallery to screw them securely to the walls. But as it takes nearly twenty minutes to assemble each painting I've been staggering this job over a number of evenings. Nearly all done now. 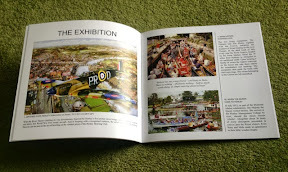 The catalogue for the exhibition has just arrived and I'm very pleased with it. here are a couple of pages. My young friend flies off to Japan today to present at a two day conference. it just seems amazing that she'll be back home on Friday. Christopher Columbus couldn't have contemplated how small the earth has become today. 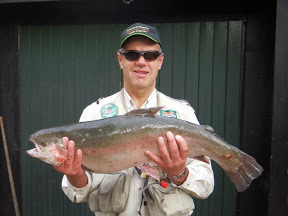 My nephew Neil is a really dedicated fisherman and yesterday he won first prize for landing the largest fish. It was a fifteen and a half pound blue trout and he put his back out in the process of landing it having to enter the lake up to his waist to net the fish under a tree. 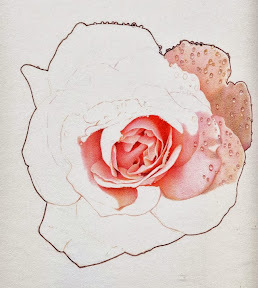 Finally this is the start of a watercolour painting of a rose I aim to finish next week.